Submitted photo Mike DeWine, pictured with his wife, Fran, has a clear plan of what he wants Ohio to become during his tenure as governor. CEDARVILLE — He hadn’t been governor-elect for 24 hours and Mike DeWine noticed a big change in his life. The patrol is there 24/7 to provide extra security for DeWine and wife, Fran, and their Greene County home. On the day DeWine sat down with the Gazette, a sheriff’s deputy was also hanging out for a bit. Welcome to the life of the man about to become the top elected official in Ohio. It’s been quite the whirlwind. After they had a chance to unwind, the DeWines did something they hadn’t done in over a year. He and Fran — who visited all 88 Ohio counties during the campaign — became used to being gone several days at a time, getting home at night and being out again the next morning. Just long enough to grab clean clothes and keep moving. “Look, you just balance it,” Mike said. But don’t think DeWine, who was born and raised in Greene County, is complaining for one second. Even before he announced his candidacy at his family’s annual ice cream social in June 2017, DeWine was gearing up for a gubernatorial run. When pressed about when and if he was going to officially announce a run for Columbus, he politely said he would make an announcement at the right time but admitted that it was no secret he wanted to run for governor. That background includes time as Greene County prosecutor, Ohio senator, U.S. senator, U.S. congressman, lieutenant governor and attorney general. DeWine added that his time as the county prosecutor and campaigning around the state will be invaluable because it gave him a good feel for local government and how important that is in Ohio. Throughout his campaign, DeWine has stressed the fight against opioid addiction and making sure every child who graduates high school is ready for college or a career. But he confirmed many other items are on the docket when he and Lt. Gov. Jon Husted — who also has ties to Dayton as a former University of Dayton football player — are sworn in in January 2019. One big goal is to help the aforementioned local governments. He did make a couple commitments that could help, including dramatically increasing money for children’s services and expanding a foster care pilot project into all 88 counties. Mental health specialists will be available to every student and teacher and Ohio will invest more in multi-jurisdictional anti-drug task forces. Another way he intends to fight the opioid crisis is to focus on K-12 prevention education and increase enrollment in a program that focuses on at-risk mothers. Only 4 percent are enrolled because of the lack of money and DeWine wants to triple that in his first year in office. DeWine said he wants to expand they early childhood education program to include more families and to improve quality. Currently, approximately 80 percent of kids that are in early childhood education paid for by Ohio are not in high-quality programs. DeWine said the Medicaid expansion will continue so residents can qualify based on income alone and he will focus on wellness for state employees, where they can receive economic incentives to hit certain targets in health. Many private employers do that already. DeWine will also keep a close eye on Wright-Patterson Air Force Base and the Miami Valley in general. As the first Dayton-area governor since James Cox left office in 1915, DeWine knows the importance of Ohio’s largest single-site employer. In fact, DeWine said part of his inaugural festivities will include an event in the area. DeWine said a cabinet level employee will report directly to him with regard to the state’s focus on military programs. When he takes office in January, DeWine will be taking over a state he says is in good shape. He said the most important natural resource in Ohio is kids. A child’s potential needs to be developed or it’s a personal tragedy for the child and bad for the state. The passage of the Greene County Career Center levy will be big help in that area locally. Just the way the career center will impact the job market down the road, DeWine wants his administration to be a positive impact in the future. But he and his staff will also welcome suggestions. 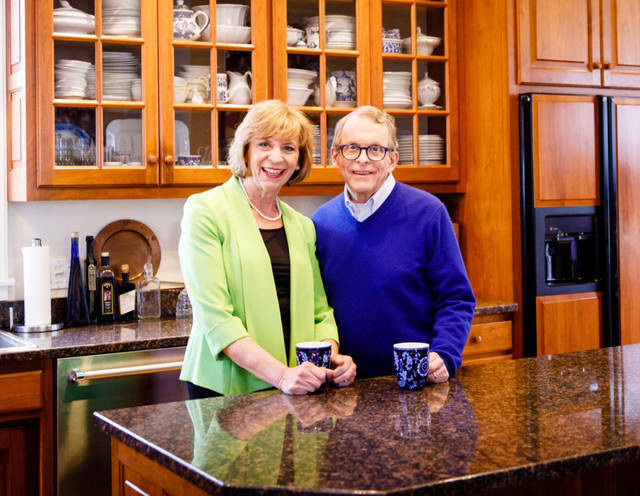 https://www.xeniagazette.com/wp-content/uploads/sites/32/2018/11/web1_IMG_3936.jpgSubmitted photo Mike DeWine, pictured with his wife, Fran, has a clear plan of what he wants Ohio to become during his tenure as governor.